Fitter and faster than ever. A direct update to Michelin's bestselling Pro3 Race tire, the Pro4 Service Course offers an excellent balance between performance and durability. With the best features of the earlier tire, the Pro4 Service Course features 110 TPI casing and an updated tread profile and material for increased grip at all angles of lean compared to earlier models. The new material offers increased wear resistance, so you can ride a little farther. Available in several 700c (622 ISO) sizes and many colors. Folding bead; actual weight 205g (700c x 23mm). 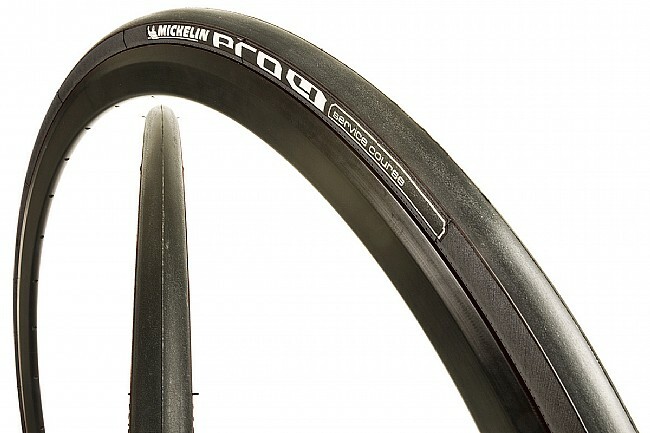 Check out the rest of the Pro4 line-up as well, including the Pro4 Endurance, a replacement for Michelin's puncture-resistant Krylion tire, and the race-specific event tires Pro4 Service Course Comp and Pro4 Service Course Comp Limited. Pro 4 has a good combination of grip, speed and endurance at value pricing from Western Bike Works. For all these reasons the Pro 4 is my favorite road tire. This is a high value tire, especially on sale. I am a Michelin fan and this is a very good tire for the money. I easily get 5 to 6 thousand miles on a setwith better than average lack of flats. You can certainly get better puncture protection but at a cost and these have greater rolling capacity without significant puncture risk. This is the tire I ride for all dry road conditions. Durable and lasts a long time. The tire corners very well and seems nimble to avoid road irregularities. Proven performance that is worth the retail but when they are the deal of the day how can you go wrong? I like how it corners. It picks up everything on the road. The rubber compound is sticky. I use this tire for training (100- 150 miles per week) and get good mileage out of these tires. They handle really well on fast downhill curves like a racing tire and yet resist flats well like a training tire should. And the bonus - great colors. I've used them on training rides and also racing crits. I have put around 600 miles on them training with no flats or wear. I like how well it does in corners going 20 MPH. Never feel unsafe! Superb dry grip, decent durability, reasonable puncture protection. In my opinion, the best all around training tires at this price point. I trust these tires for high speed cornering. When WBW has these on sale, they are the best value anywhere. I've used The Michelin pro 4 for years. Great feel and reliability on the road and I love the red side walls to match my bike. A fast and safe tire for the streets. I have been riding on both of my bikes these tires for numerous years. (TREK carbon & KLEIN Quantum) I have them mounted on ROLF VIGORS rims. They are fast yet sticky for safely hammering corners. I started using the Michelin Pro4 Service tires at the recommendation of a friend after having a really bad experience with some Conti tires. The beads are really flexible, so it's really easy to service a flat on the road. The tires feel really nice when cornering, and the puncture resistance so far has been great. These are really smooth rolling and comfortable tires, and grip extremely well on our wet, soggy, slimy PNW roads. I got these for training in the ever-so-popular size 25 mm with, and my harsh wheels with aluminum alloy spokes are now rather comfortable! Who knew?! No flats as of the writing of this missive. I should buy more as these are a wicked-good deal. Excellent road feel, surprisingly long life &40for a race tire&41. I bought these tires for a bike I was riding on weekends for an upgrade in performance. The bike I was commuting with finally bit the dust and I decided to start riding the weekend bike to work. I just put new tires on after deciding that the old ones had worn a little too thin and the shape was rather flat. Honestly, I could probably get away with a few hundred more miles, but don't want to risk it. There were several small cuts from all the riding, but only one reached the cord (it was from a very sharp glass shard I picked up in a parking lot a few months back). I estimate that I got about 3500 miles out of them, and most of those miles were commuting. I rode all through winter and in some poor conditions. They held up beautifully and gave me a much longer life than I ever expected. I did notice that they seemed to wear quickly for the first 200-300 miles, but then they wore slowly for the rest of their life. I have no complaints to make-they're quite fast, corner well, and feel good on the road. Incidentally, I bought the tires with the white accent, despite riding in all kinds of conditions, I didn't have much trouble keeping them pretty clean. I highly recommend these tires! Lightweight, fast rolling tire with good road feel and traction. Better sidewall durability than Conti. Wear life is reasonable for a light, fast tire. They're not the ultimate low rolling resistance tire, but the combination of wear life, rolling resistance and price can't be beat. Very pleased with the ride and comfort and durability of the pro 4 michelin tires.